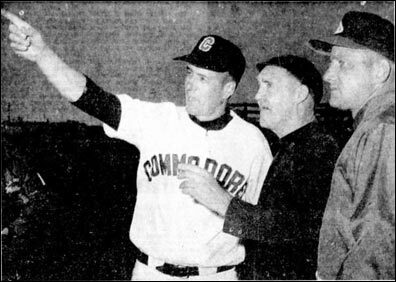 Left - May 30, Saskatoon manager Spero Leakos (left) points to the sky suggesting it might not be a good night for baseball, but umpire Ace Corbin (Centre) and Unity manager Erwin Doerksen were not convinced. In spite of some rain, Unity went on to down the Commodores 5-1 in the opener at Saskatoon. Right - Saskatoon's import hurler, right-hander Dirk Van Dyke from San Diego State University. College teammate Dave Middleton also joined the Commodores. 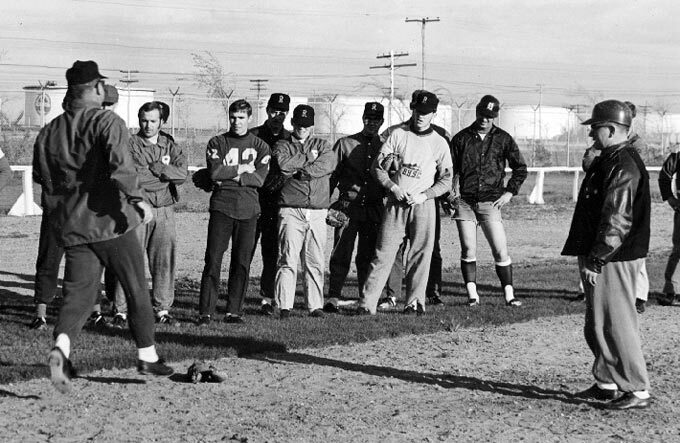 The player doing the drill is Gene Yellowega (extreme left). 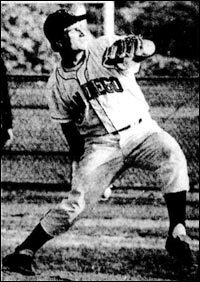 The first recognizable face to the right of Gene's arm is Randy Sawa, Then Al Herback. Then Jim Paisley. Behind Al/Jim with face half in shadow is probably Jerry Zrymiak. Next is Danny Fink (face in shadow). Then Andy Logan. Then the guy in cutoffs is Stu Willison. Then Lionel Ruhr (far right) in profile. Photo compliments of Eva Ruhr (mother of Lionel Ruhr). Player ID's supplied by Jim Paisley and Rich Gergley (Regina Red Sox players during the 1960's and 1970's) . Wayne Thompson of Melville Millionaires (No. 5) is safe at first as first sacker Rich Gergley is pulled off the bag to grab a throw from second baseman Larry Bachiu. 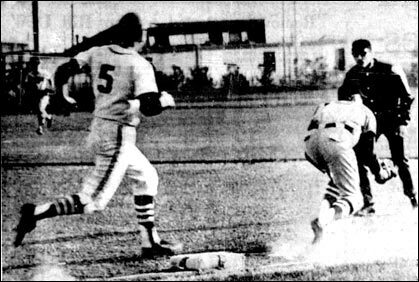 The base umpire is Don Duperreault. 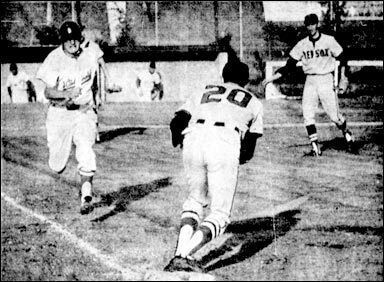 Yorkton Cardinals' shortstop Nelson Bryksa charges down the line trying to beat the throw to first in a Southern League game at Pleasant Park. Regina first baseman Jack Buch (20) completes the put out after taking the throw from pitcher Bob Fellner (right).